Facebook on Friday released its Android launcher called Home. The company also updated its Facebook app, adding in new permissions to allow it to collect data about the apps you are running, as pointed out on Hacker News. New permissions for Facebook Home [http://bit.ly/fbhomeapp]. Glance at your phone for the latest photos and posts from your friends. Use chat heads to keep chatting with your friends while using other apps (requires Facebook Messenger [http://bit.ly/fbandroidmessenger]). See news as it happens with bigger, bolder notifications. As such, it’s the Facebook app that’s doing all the information collecting. It’s unclear, however, if it will do so even if Facebook Home is not installed. 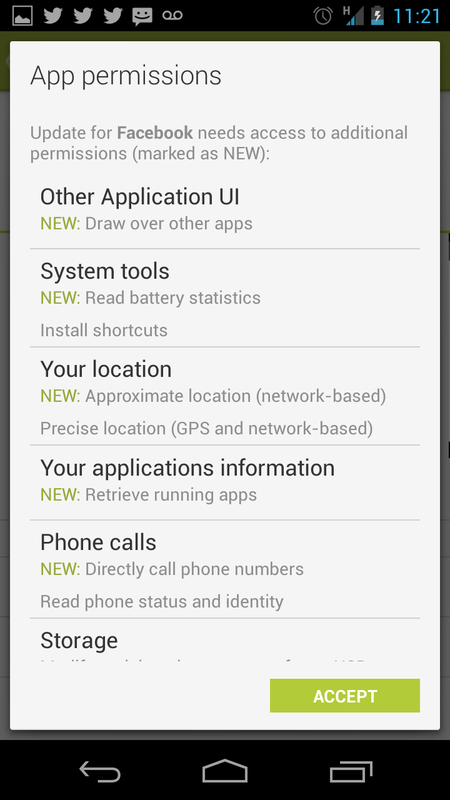 Facebook may simply be declaring all the permissions the Home launcher requires, meaning the app only starts collecting data if Home asks it to. Still, given Facebook’s reputation surrounding privacy issues, this is something the company will want to clarify. We have contacted Facebook about this change and will update this article if we hear back.